MPHC is an award winning primary care centre and has been recognised both nationally and internationally for the quality of the building and the work we do. WONCA the international GP conference was held in Prague this year from June 25th to 29th bringing together GPs from all over the world. The topics covered were numerous and included Primary Care Policy, Financing, Practice Organisation, Consultation Skills, Research in General Practice, Quality of Care, Integrated Care to name but a few. There were also sessions on clinical management including Prevention and Screening, Respiratory Problems, Mental Health, Vaccination and many more. Prior to the conference there was a call for posters and MPHC submitted 6 of the posters we had exhibited at the National Primary Care Conference in MPHC in November 2012. 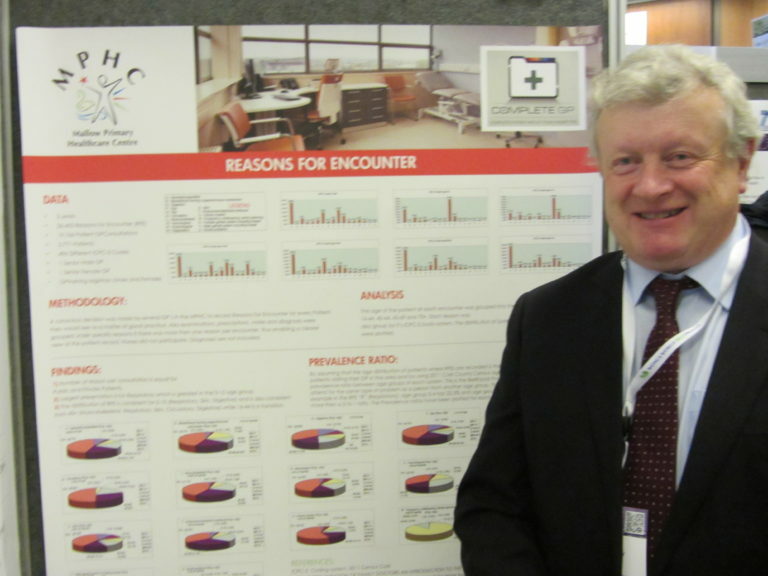 The 6 posters were presented at the conference and we are delighted that 2 were awarded best posters ‘ Reasons for Encounter in Primary Care – Dr. David Molony’ and ‘Group based psychoeducational training for family caregivers of people with dementia – Sheena Cadoo and Rosarie Crowley of the HSE. This is even more significant in that only 6 posters are selected for awards every 3 years. Well done to Dr David Molony, Dr Audrey Russell, Carl Beame, Sheena Cadoo and Rosarie Crowley. Last year there was only 1 poster from Ireland and we are delighted that MPHC had 6 this year and even more delighted to have won two prizes recognising the quality and quantity of research we do in MPHC. 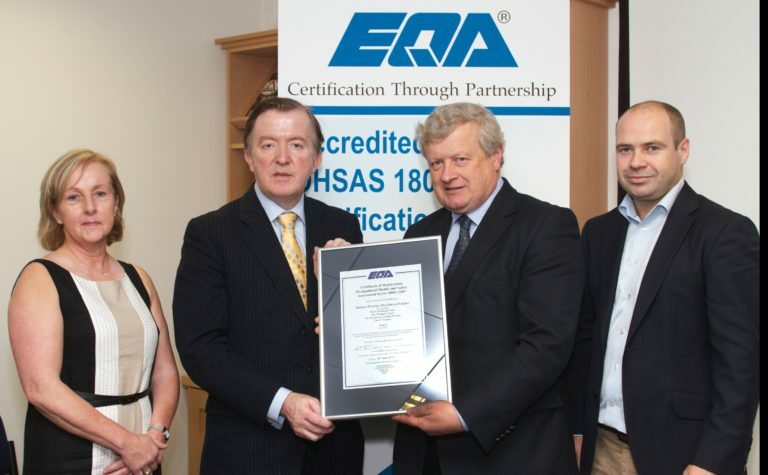 Mallow Primary Healthcare Centre awarded OHSAS 18001 Certification by EQA. 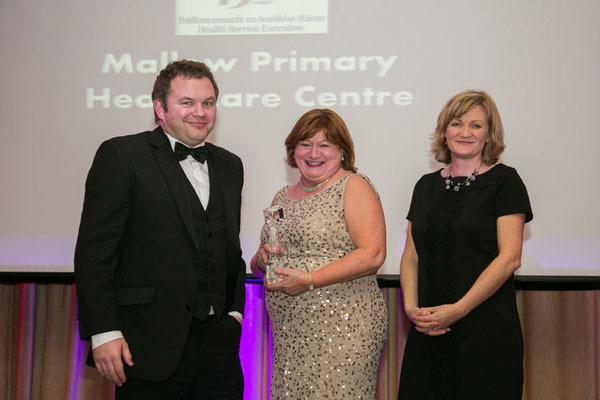 Mallow Primary Healthcare Centre, Co. Cork has become one of the first Primary Healthcare Centres to be awarded an Occupational Health & Safety Management System certificate. EQA (Ireland) are the first and currently the only certification body with OHSAS 18001 accreditation from the Irish National Accreditation Board (INAB). Certificates were presented by Mr. John Perry TD, Minister for Small Business at a ceremony marking the launch at the National Irish Safety Organisation (NISO) head office in Dublin. Pictured at the certificate presentation were (from left to right):John Perry TD Minister for Small Business, Dr. David Molony – Mallow Primary Healthcare Centre, Damian Casey and Christine Daly Director EQA. 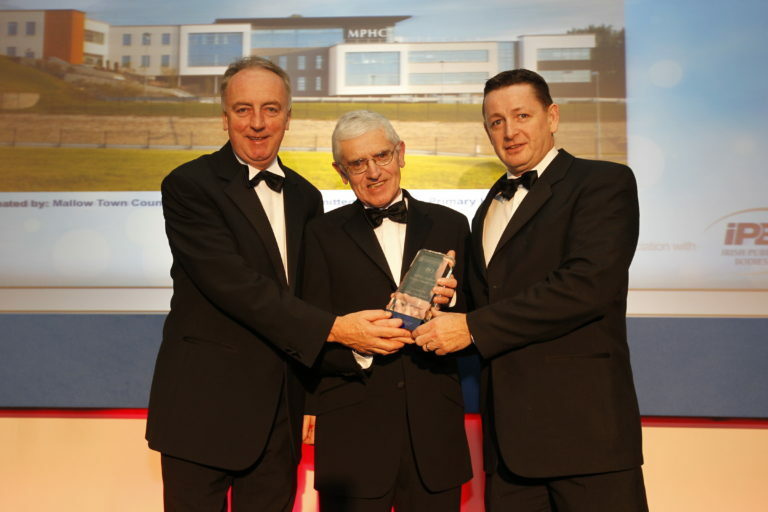 Mallow’s state of the art Primary Healthcare Centre (MPHC) won Best Healthcare Building at the 2012 Local Authority Members Awards (LAMA) in Dublin. The awards recognise local projects of excellence in the areas of infrastructure, community development, recreation and national impact initiatives. It was the suggestion of Mallow Town Councillor Noel O’Connor that Town Council nominate the centre, which was officially opened by Health Minister James Reilly in April 2011. MPHC launched in May 2010, as the new state of the art home for 3 general practices formerly located in Mallow town, the Cork Road Clinic, the Red House Family Practice and the Medical Centre as they centralised their services to the one location in the Mallow Business Park together with HSE primary care services, South Doc and North cork Community Mental Health . MPHC has since expanded to include “The 4th Practice”, which provides additional medical services and enhanced diagnostic procedures such as psychology, nutrition, physiotherapy and specialist clinics. In September, 2011 over 1,100 EARLI (Emergency Admission Risk Likelihood Index) surveys were posted to patients over 70 years of age, registered with the three General Practices based at Mallow Primary Healthcare Centre. The response rate was 80%, with a total of 21 patients identified as very high risk and 51 patients as high risk of emergency hospital admission. From December 14th, 2011 to December 14th, 2012, an intervention team, based at MPHC evaluated the needs of these very high risk/high risk patients. The team comprised of a GP, public health nurses, a physiotherapist and a researcher. Each patient was discussed by the intervention team and visited by the public health nurse for a full surveillance assessment. Medication was also reviewed and referrals were made to HSE services, GPs and day centres. The work of the intervention team is highly commendable and there is a strong case for this to be the blueprint of primary care teams. The research has shown a 54% reduction in the very High Risk patients and a reduction of 25% for the high risk patients. It is anticipated that an average of 25-30% reduction will be achieved annually. 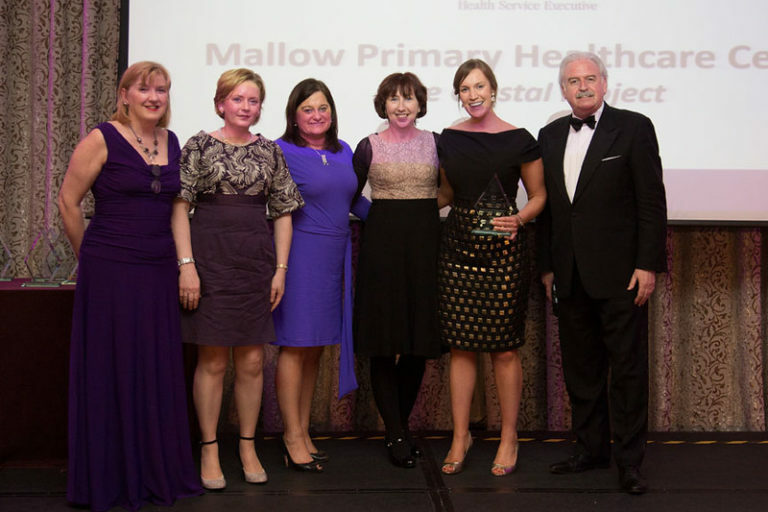 This research won best Public Health Initiative at the Irish Healthcare Awards, 2012, and will be rolled out in five other primary care teams in Cork North. It will also be repeated in MPHC. This research would not have been possible without the vision and support of the MPHC GPs and the HSE. 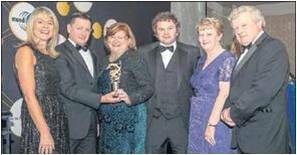 North Cork HSE Psychology Department was awarded the 2012 WAIMH Award (World Association for Infant Mental Health) at the 13th World Congress of WAIMH in South Africa in April 2012. This award was presented in recognition of their contribution to the worldwide Infant Mental Health Community through the setting up of an affiliate Infant Mental Health Group in Ireland and the promotion of the development of Infant Mental Health services in this country.